WASHINGTON, D.C. -- President Donald Trump's job approval rating averaged 45% in Gallup polling last week, tying his personal high. His previous 45% rating occurred in the first week after he was inaugurated as president. Improved views of Trump last week may stem from his high-profile meetings with North Korean leader Kim Jong Un held early in the week. 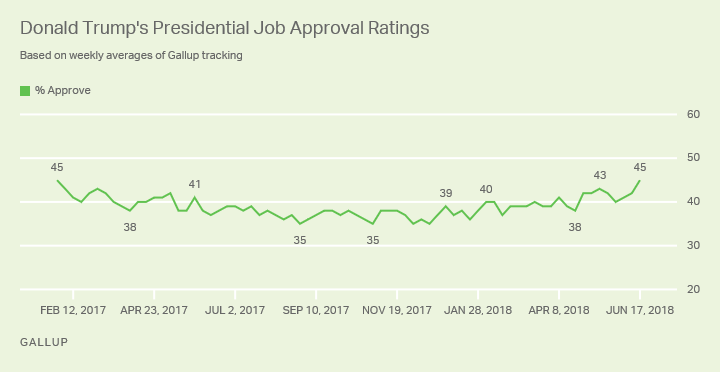 While high for Trump, his 45% job approval rating last week is below the historical average of 53% for all presidents in Gallup polling since 1945. Throughout his term, Trump's job approval ratings have ranked well below those of other presidents at similar points in their presidencies. Trump's job approval rating has averaged 39% since the start of his term. However, it has been 40% or higher since late April as the U.S. unemployment rate has hit lows not seen in decades, and the U.S. and North Korea moved toward talks designed to denuclearize the Korean peninsula. The recent increase in Trump's approval puts his rating on par with those for several other presidents during June in their second years in office. These include Barack Obama (46%), Bill Clinton (46%), Ronald Reagan (45%) and Jimmy Carter (43%). Other elected presidents had significantly higher approval ratings during the same month, including Dwight Eisenhower (62%), John Kennedy (70%), Richard Nixon (55%), George H.W. Bush (68%) and George W. Bush (73%). Trump has averaged 87% job approval from his fellow Republicans thus far in his second year in office, up from 83% in his first year. That has helped keep his overall job approval at or above 40% among all Americans during much of 2018. During the past two weeks, 90% of Republicans have approved of Trump. The only other time Trump has had 90% approval among his fellow partisans was during the week of his State of the Union address. 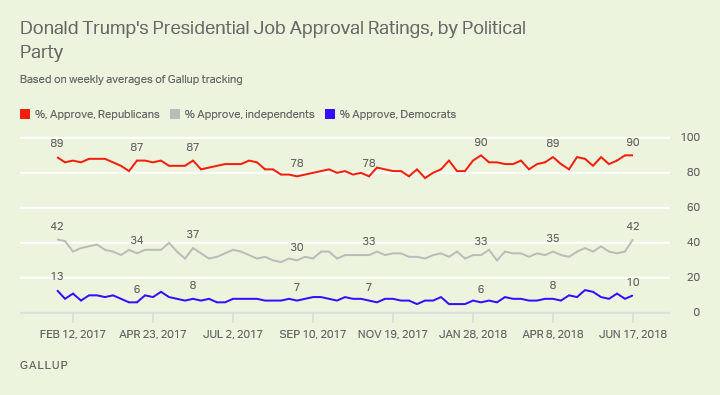 This past week saw an increase in approval among independents to 42% -- up from 35% the prior week -- which tied for the highest Trump has registered among this group to date. It is only the fourth week in Trump's presidency in which 40% or more of independents have approved of the job he is doing. His job approval ratings remain very low among Democrats, currently at 10%. Trump's accomplishments on the domestic and international fronts have helped solidify his support among Republicans. Given that only about one in four U.S. adults identify as Republicans, he needs to broaden his support to earn high approval ratings. While still low in an absolute sense, his bump in support among independents to 42% last week was enough of an increase for Trump's job approval to match his personal best. Regardless of what Trump does, it seems unlikely he will engender much support among Democrats -- similar to Republicans' low approval ratings during much of Obama's presidency. It is unclear how long Trump's overall job approval ratings will remain higher than usual. Although few dispute that the Trump-Kim meetings were historic, there are questions about what those meetings accomplished and whether North Korea will ultimately agree to the denuclearization the U.S. is seeking. The U.S. economy is likely to remain strong in the short term, but Trump's trade policies and the Federal Reserve's raising of interest rates could slow growth. News coverage of Trump's administration in recent days has focused on a controversial U.S. policy under which immigrant families attempting to enter the U.S. illegally are being separated. Many elected Republican officials have publicly stated their opposition to that policy, and the policy could cause independents' recent more positive feelings about the president to fade. 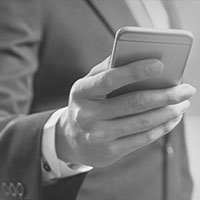 Results for this Gallup poll are based on telephone interviews conducted June 11-17, 2018, on the Gallup U.S. Poll, with a random sample of 1,511 adults, aged 18 and older, living in all 50 U.S. states and the District of Columbia. For results based on the total sample of national adults, the margin of sampling error is ±3 percentage points at the 95% confidence level. For results based on the total samples of 450 Democrats and 452 Republicans, the margins of sampling error are ±6 percentage points at the 95% confidence level. For results based on the total sample of 554 independents, the margin of sampling error is ±5 percentage points at the 95% confidence level. More than four in 10 Americans strongly disapprove of the job Donald Trump is doing as president -- exactly the same percentage as 15 months ago. Americans' satisfaction with the way things are going has risen to 37%. The last time it was higher was in September 2005.